First novel in epic fantasy series from one of my favorite authors. Novel is acclaimed by most. Wait two years before beginning to read novel. Read novel. Wonder why in the world I waited so long to finally read it when it had been sitting on my shelf since before publication. Welcome to Range of Ghosts, the first novel in Elizabeth Bear’s Eternal Sky trilogy, an epic fantasy that if you have previously read Bear’s work will not surprise you (though it should delight you) that the fantasy is not based on more “traditionally” Western European elements and more on Eastern cultures. Without knowing a whole lot about more Eastern cultures, I get a Mongol vibe from part of the setting, and I imagine part of the journey gets towards some Middle Eastern cultures (that is an assumption based on some textual descriptions). Thing is, this isn’t an attempt to necessarily praise Bear for writing from a different cultural perspective. The reader in me sees the new setting and thinks, “cool, a new place!” and then gets on with digging into the actual story that Bear is telling. Folks, *this* is where Elizabeth Bear excels. Character and story. This is a grand, big story rife with civil war, fratricide, adventure, wonder, tightly wound fear, grace, and pretty much everything else thrown in to a barrel, blended well and painted with masterstrokes. I could tell you that there is a surviving tribesman who is a scion of the Khagan dynasty, a princess turned wizard, another princess on the run, a tiger-woman, a sorcerer or sorts, and a host of other characters who all are presented as richly conceived characters with their own motivations and needs and who are acting because this is the way they would act in this situation, not because the plot demands it. The reader gets the sense that Elizabeth Bear is telling the stories of these characters who already exist, not that she created them from a blank canvas to tell a particular story that she wanted to tell. Except, that is exactly what she has done. This is another mark of just how damned good at this stuff Bear is. She does the hard work and makes it look natural. 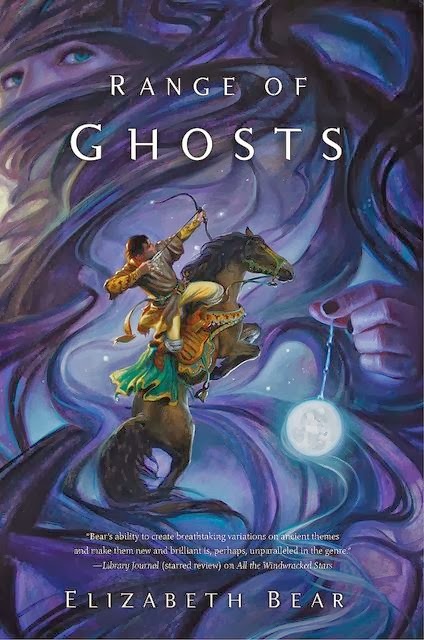 I started to write that you should read Range of Ghosts because it is a starkly original novel that draws on cultural elements that are seldom used much or well in most western fantasy novels, but the more I thought about that, the more I realized that it was a bunch of crap. Range of Ghosts is not medicine, and you shouldn’t read it because it is good for you, with or without a spoonful of sugar. That is a terrible reason to choose to read a book (though, better than choosing not to read a book at all). You should read Range of Ghosts because it will thrill and delight you. You should read Range of Ghosts because you will marvel at how cool some of the stuff going on in the story is (I may have said “holy crap, that’s awesome” at least once). You should read Range of Ghosts because it is the first volume of a trilogy that you really, really want to finish to find out what happens next and how it all comes out. You should read Range of Ghosts because it is a friggin fantastic novel that might just knock your shoes, socks, and pants off and will make you wonder what, exactly, Elizabeth Bear is doing with all of those shoes, socks, and pants that keep getting knocked off people. Probably creating a black market for pants. You should read Range of Ghosts because it’s just that damn good of a book and you will seriously be missing out if you don’t. That’s probably a good enough reason, don’t you think? Can we also maybe pause a moment and just look at that cover from Donato Giancola? That is one seriously gorgeous cover.